Ok, you have your mining and skinning skills together and you’re working them hard. Maybe your other alts have all the crafting skills, maxed. You’ve got a ton of sellable stuff, at least you hope it’ll sell, and it’s time to get the stuff onto the Auction House. So do you stop what you’re doing, run back to town, hope on the nearest bird-like thing, and fly to the capital city, hit the mailbox, and then the Auction House, and then travel all the way back to your looting fields? Or mage-port to the city and then find your way back? Or do you just dump it all into the nearest mailbox and send it to your banker alt (mule) and get right back to the looting/crafting/raiding? Off to the Auction House! Simply put, you create the character, level it up to 5 or so, and then run it to the nearest AH where it’ll spend the rest of its career. Why level 5? Because then you can get Enchanting which will allow you to disenchant low level items, which can make a nice cash flow by itself. Or just keep it at level 1 and do the disenchanting on your higher level chars. Select a name for this character that is easy to remember and type, because you will be sending mail (items and money) to this character from all of your other characters on the same server and you don’t want to send your stuff to the wrong character by mistake! Names full of special characters make mailing stuff to that character awkward. Names like “Phredd” are good. I recommend not naming this character something silly. Skip names like, “Bobsbank,” “isellstuff,” and so on. Just give it a regular name, the random name generator in the character creator is great for this, as long as you can remember the name, and don’t connect it to your main character at all. Then add this mule character’s name to the friend list of all your other characters, which will avoid all future miss-sending of mail. Once your character is ready then you run it to the nearest capital city, such as Stormwind or Orgimmer. Stay on the main road, keep your eyes open for things that will kill you, and you should be safe enough. Any big city will do, but Storm and Org make it easier if you want to buy/sell through the trade channel. When your mule arrives in the city you should station it by the mailbox nearest to the AH. Now, whenever your gathering character’s inventory is full of good loot to sell you only need to travel as far as the closest mailbox, instead of travelling to the AH. Horde-side I actually like Silvermoon city, at the west Auction House, instead of Orgrimmar. There is a mailbox about five feet from the auctioneers, the bank is nearby, and the crowds are nill. Alliance side I like Stormwind for the same reasons, except the crowds. Ironforge is good and the Exodar is a Ghostland. Feel free to use whichever city you prefer. Log into your mule when you’re done looting/playing/raiding/PvPing, etc., and post your items for sale. This allows you to pay attention to selling when it’s AH time and to pay attention to the game when it’s “hack and slay” time. One alt can be the central banking station for all your characters on that server. They all send loot to the mule/banker to sell and most of the cash is kept on that character. Need an item? The banker buys it and sends it to the appropriate character. All the cash stays in one place which makes it easy if I need to send gold or items to one of my characters or to a friend. You can store heirlooms, bind on account gear, and those armor tokens from the Timeless Isle or Tanaan or your Shipyard (in addition to sellable loot.) Send the gear to your other characters as they require it. Need more space? 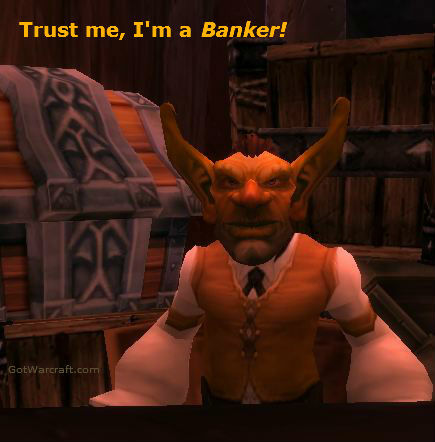 Consider making (or buying) your own private guild, with just your banker. Offer gold for signups and then kick everyone when the guild goes live. Buy a couple more guild bank tabs and you will have lots of storage space. Every once in awhile someone sells a guild in the trade channel, which is where I bought mine. It’s easier than running around and collecting signatures. Well, since you only need 4 signatures these days just offer some gold for a signup, with the understanding that you will kick everyone after your guild is official. Dressing up just adds distinction to your banker. There’s no reason that you can’t run around in a Tuxedo, dress, or fancy outfit. Various styles of clothes are available, in addition to the regular gear. Obviously high level characters have the gear advantage, but even a level 1 can wear a Tux. You can get it made by a friendly tailor (or an unfriendly one, if you have enough gold) or just buy it off the AH. Some people use the costumes from the various seasonal events, such as the Pilgrim’s outfit. Use your imagination. Auctioneer – See our Auctioneer page. Not as essential as it once was, especially with Auctionator and Tycoon out there, but still pretty nice. It does some deep digging and analysis of what’s happening on the AH. Auctionator – Create shopping lists, easily cancel auctions where you’ve been undercut, and more. Pretty nice. Much faster scanning than Aucitoneer, though not as deep. Altoholic – store stuff on your alts and this addon helps keep track of the stuff. Guild, Bags & Inventory, Mail, Professions, and Quests & Leveling. Got lots of alts? Then check it out. Bulk Mail Inbox – Bulk mail reception made really easy. This addon allows you to selectively pick mails to open from the inbox, open all mails with money or open all items. It displays up to 50 items in one window, with info on each item. This is very nice if you’ve made a lot of sales, since the window will be filled with gold print. Tycoon – This slick addon is more important than all the others put together. It’ll scan the Auction House, research the economy on your server, and tell you just exactly what you need to do to make a ton of gold. It will alos save you a ton or research end work. Get your Tycoon here.